Daily Illuminator: I Play Munchkin! Tell Me About The Munchkin Collectible Card Game! March 30, 2018: I Play Munchkin! Tell Me About The Munchkin Collectible Card Game! 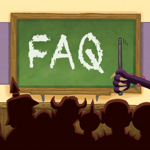 Now that the Munchkin Collectible Card Game is out in the world, we've been getting some questions from existing Munchkin fans, asking what they need to know as they try our new game. Let's answer them! Q: What do you mean, "collectible card game"? I've been collecting Munchkin for years! A: First of all: Thank you! The term "collectible card game" refers to a specific style of game, in which the players acquire cards through buying starters, boosters, or single cards in stores or by trading with other players. Then they build a deck from the cards they have collected, subject to certain rules. Q: Wait, so you don't just shuffle everything together in the Door and Treasure piles? A: Correct. First, there are specific rules for deck-building; you won't be using all (or even most of) your cards in every game. Second, there aren't decks that all players draw from in the Munchkin Collectible Card Game. All the cards have the same back and you are the only one who draws from your deck. Q: Huh. What other differences can you tell me about? A: Loads. Let's start with the actual gameplay. The "classic" Munchkin games are all about being part of an adventuring party, killing monsters and looting rooms and trying to make it to Level 10 before everyone else. They're designed for 3 to 6 players. The Munchkin Collectible Card Game, on the other hand, is a head-to-head battle between two players, each with their own deck of cards. Heroes send monsters to attack their opponents, rather than finding them in a common deck of Door cards. The point of the game is not to reach Level 10 (in fact, many games will end well before that point); it is to put enough damage on your opponent's Hero card that they are "squished" or to run your opponent out of cards. Q: That sounds great! Will my existing Munchkin cards fit in the new game? A: No. Totally different game, totally different cards. To help avoid confusion, we even made the cards a different size. Q: Do the Classes and Races work similarly? A: Your Hero in the Collectible Card Game has a race and class already, such as the Centaur Warrior or the Orc Bard, and their powers don't match the ones in original Munchkin (which makes sense, as the rules are completely different). Q: So if this is a different game, why call it Munchkin at all? A: It's set in the world of Munchkin. The designers, Eric M. Lang and Kevin Wilson, were inspired by the humor and fun of Munchkin and wrote a new game that pokes (usually) gentle fun at other collectible card games the way original Munchkin pokes fun at roleplaying games. It has the same tone, not the same mechanics. We made sure to include your favorite Munchkin characters and devices in the Collectible Card Game, including the Chainsaw of Bloody Dismemberment, the Unnatural Axe, and of course, the Plutonium Dragon. Q: Do I just buy a box and dive in? A: You certainly can, with one of our two-player starter sets or the Introductory Set (coming later this year) that has cards for all six Heroes – that way, you and a friend can start playing as soon as you open the box. Once you've got the basics down, you'll almost certainly want to get some randomized booster packs to flesh out your decks. Q: Randomized? Aren't all the boosters the same? A: In Munchkin, all the small expansions are identical. However, in the Munchkin Collectible Card Game, each booster contains 12 cards chosen from a larger set of cards, and the boosters are randomized so you'll never know exactly what you're getting, and some of the cards are more rare than others. That's part of the fun of the Collectible Card Game! Q: Do I need those rare cards to win? A: Not at all! You can be a competitive player with just common and uncommon cards. Many of the super-rare cards have different art or are cool in some other way that doesn't affect gameplay at all. Q: Will there be more releases for the game, or is this first set of 304 cards all there is? A: Tons more releases! We have three expansions coming out later in 2018: The Desolation of Blarg, Fashion Furious, and Grave Danger. Each one is a new set of 124 cards, released in 12-card booster packs just like the first packs we've already talked about. You'll still need a starter set or the Introductory Set, though, for the Hero cards and the other components you'll need to play the game. Q: OK, that all sounds cool. Where can I learn more about the Collectible Card Game? A: Head over to munchkinccg.game! We have several articles aimed at new players, including information about building a deck, some basic strategy articles, and guides to the six starting Heroes. And we're adding more news and information all the time! You can also check out your friendly local game store to pick up some cards yourself!